Before moving to Washington County a year ago, the Rev. Dan Thornton lived in Alaska, where he and Susan, his wife of 30 years, went after college. He recalls early in his days there receiving a 2 a.m. phone call to butcher a moose that had been struck on the road to salvage the meat for charity. He thought it seemed like an odd request of a Christian ministries major with minors in music and Hebrew/Greek who had never hunted or fished. Such is life in The Land of the Midnight Sun. A pastor with the Fellowship of Grace Brethren Churches, Thornton resigned from his parish in Alaska four years before moving here. He and Susan agreed they would stay in Alaska until the youngest of their four children graduated from high school in 2010. After 20 years with the Alaskan church, Thornton worked a variety of jobs. He led worship for a Southern Baptist church, worked as a manager for his brother’s construction company, worked as director of operations for a mission in central Africa and taught computer-related courses at a Christian-based vo-tech school. Thornton then learned of an opening at Maranatha Brethren Church in Hagerstown, off Jefferson Boulevard. He interviewed for and was offered the job, and the couple moved here last June. “We unloaded the moving van in 104 degrees. Talk about a warm welcome,” Thornton said. The Thorntons recently bought a house in the Smithsburg area and moved in after Easter. Thornton, called Pastor Dan by his congregation, said the church is experimenting with a different leadership style, with him as executive pastor, providing leadership and coordinating ministries at the church, while preaching once or twice a month. 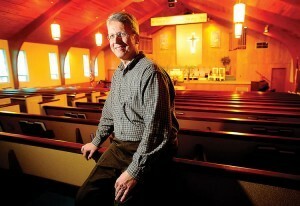 Ron Shank, the church’s youth pastor for 23 years, preaches some Sundays and leads worship regularly. “I’m a lot into strategic planning. I came here and fell in love with the people. The role seemed to fit me well,” Thornton said. Thornton coordinates the music at Maranatha. Susan is active at the church, playing piano and singing, he said. A trombone player, Thornton said he was involved with church cantatas and community musicals like “The King and I,” and sang in a barbershop chorus in Alaska. He has been playing with the Ellicott City (Md.) Trombone Choir. Thornton, 52, was born in Indiana. His father was a pastor and the family moved around, living in Lanham, Md., during Thornton’s fourth- through 10th-grade years. He met Susan, “a farm girl from Michigan,” when his family moved there. The two knew each other through church youth rallies and camp, dated a couple of times in high school, then attended Grace College. Dan went to Grace Seminary in Winona Lake , Ind. Thornton is an avid hiker. He said it was hard for him to leave the mountains of Alaska.